However, as is the tradition in most of France, the host of this accommodation bridges the gap between public holidays on a Thursday or a Tuesday and the weekend. This is called 'Faire le Pont'. These are the French School holidays for the Manche(50) department. There is a reason why this unimposing, comfortable bed and breakfast near Mont Saint Michel and Saint Malo in Normandy is so popular. 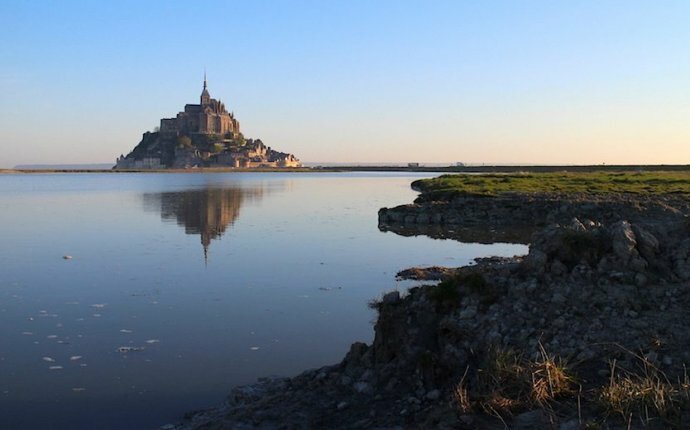 You can literally walk to Mont Saint Michel from the B&B (it's only a couple of kilometers away) using a wide gravelled trackway which means you avoid all of the traffic and queues in the high season. Perfect! The B&B, surrounded by well-maintained gardens, is a haven of peace and tranquillity, a real sanctuary after the madness of a day on Mont Saint Michel. Your hosts who speak fluent English are full of enthusiastic advice on the best restaurants in the village and the 'must visit' sights in the area. St Malo, Cancale, Dol de Bretagne, Avranches and Rennes are all within a 45 minute drive and even the D-Day Landing beaches are less than 2 hours away by car. Danielle's copious buffet breakfast (cereals, yoghurt, lovely breads, homemade jams and cheeses and of course croissants) is sure to set you up for a day of explorations. Max, the friendly resident cat, will be there to welcome you on your return. If you have one of the ground floor rooms with patio doors that open directly onto your own little terrasse and the pretty gardens you can sit out and enjoy the last of the sun's rays before retiring for the night. You are sure to get a good night's sleep here. The peace and quiet of the place and the most wonderfully comfortable beds will see to that. Parking at this B&B is perfectly secure and there is free WiFi throughout. The accommodation has six double rooms, all of a good size and all beautifully decorated and furnished with antique furniture and quality bed linens. Some are on the ground floor and some are on the first floor of the accommodation. All rooms have an en suite bathroom with shower and WC. Each room can accommodate an additional full size single bed and also a cot if required. One of the double guest rooms has a bathroom which is not en suite but in a room opposite. This bathroom is private and for the sole use of this bedroom. Check in is between 11.30 and 13.00 hrs or between 17.00 and 20.00 hrs unless by prior arrangement.